Yankees Power Hitter Mantle and Berra from 1957 Topps set. 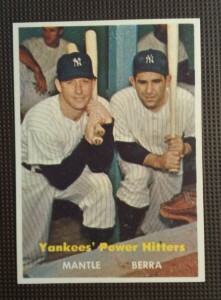 A great looking card featuring two Yankees Stars. But the card we have here today is not all that great. In fact, as the title of this posts says, this is a counterfeit. This particular fake is testament to the ever evolving counterfeiters. 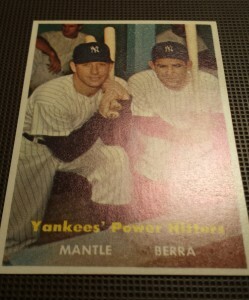 This card upon first glance is somewhat of a convincing fake. It takes some closer looks to spot the problems with this card. It may be a bit hard to see in the photo, but one will notice the spray of fine blue dots all in the white ares of the card and border. 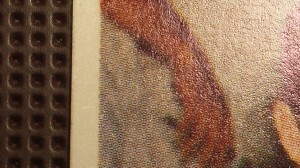 It is one of the few flaws in the quality of the printing. 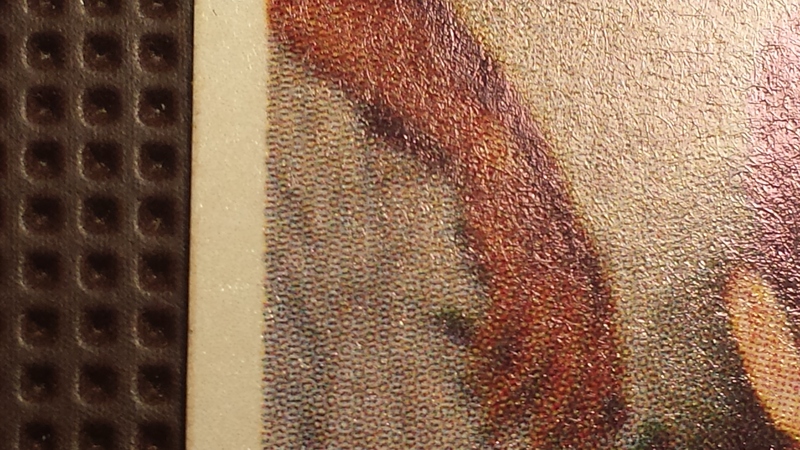 Tilting the card under a light source reveals the wrong type of ink that I have talked about before. Notice the shiny purple sheen the surface has? The gloss that should be covering the printing is not there, either. Finally, we look at the edges. Here we find a common move by the frauds that make these cards. Notice the thin line in the center of the cards edge? That is a thin strip of metal foil sandwiched in-between the two halves of the card. This is an apparent attempt to make the incorrect modern stock feel closer to the correct weight.